National home sales rose by 4.1% in June compared to May, the first such rise this year. Even so, June’s sales activity remains well below the monthly pace of the past five years (see chart). The sales gains were led by the Greater Toronto Area (GTA) as 60% of all local housing markets reported increased existing home sales. According to the Toronto Real Estate Board, sales were up 17.6% in the GTA on a seasonally adjusted basis between May and June. In contrast, sales in British Columbia continued to moderate. The Real Estate Board of Greater Vancouver reported a 14.4% decline in home sales last month compared to the month before. June’s sales for the GVA were 28.7% below the 10-year June sales average. On a year-over-year (y/y) basis, sales declined a whopping 37.7%. National home sales activity declined almost 11% y/y. Annual sales hit a five-year low and stood nearly 7% below the 10-year average for June. Activity came in below year-ago levels in about two-thirds of all local markets, led overwhelmingly by those in the Lower Mainland of British Columbia. B.C. was hit with a double whammy as the province raised the foreign purchase tax as well. Also, mortgage rates have risen increasing the burden of the new stress tests. Looking ahead, home sales and price gains will likely be dampened by higher interest rates as the Bank of Canada just hiked the benchmark rate once more last week. The prime rate rose from 3.45% to 3.70% in the wake of the rate hike, while the posted 5-year fixed mortgage rate–the critical stress-test yield–remained steady at 5.34%. Nevertheless, more upward pressure on mortgage rates is likely over the next couple of years as economic activity bumps up against capacity limits and inflation edges upward. The Bank made it very clear that further interest rate hikes are on the way but reiterated that it will be taking a gradual approach to future increases, guided by incoming economic data and a recognition that the economy is more sensitive to interest rate movements now than it was in the past. The number of newly listed homes fell in June by 1.8% and also remained below levels for the month in recent years. New listings declined in a number of large urban markets including those in B.C.’s Lower Mainland, Calgary Edmonton, Ottawa and Montreal. With new listings up and sales virtually unchanged, the national sales-to-new listings ratio eased to 50.6% in May compared to 53.2% in April and stayed within short reach of the long-term average of 53.4%. Based on a comparison of the sales-to-new listings ratio with its long-term average, about two-thirds of all local markets were in balanced market territory in May 2018. On a national basis, the Aggregate Composite MLS Home Price Index (HPI) rose only 0.9% y/y in June 2018, marking the 14th consecutive month of decelerating y/y gains. It was also the smallest annual increase since September 2009. Decelerating y/y home price gains have reflected mainly trends at play in Greater Golden Horseshoe (GGH) housing markets tracked by the index. Home prices in the region have begun to stabilize and trend higher on a month-over-month basis in recent months. Condo apartment units again posted the most substantial y/y price gains in June (+11.3%), followed by townhouse/row units (+4.9%); However, price gains for these homes have decelerated this year. By contrast, one-storey and two-storey single-family home prices were again down in June (-1.8% and -4.1% y/y respectively). Benchmark home prices in June were up from year-ago levels in 8 of the 15 markets tracked by the index (see Table below). 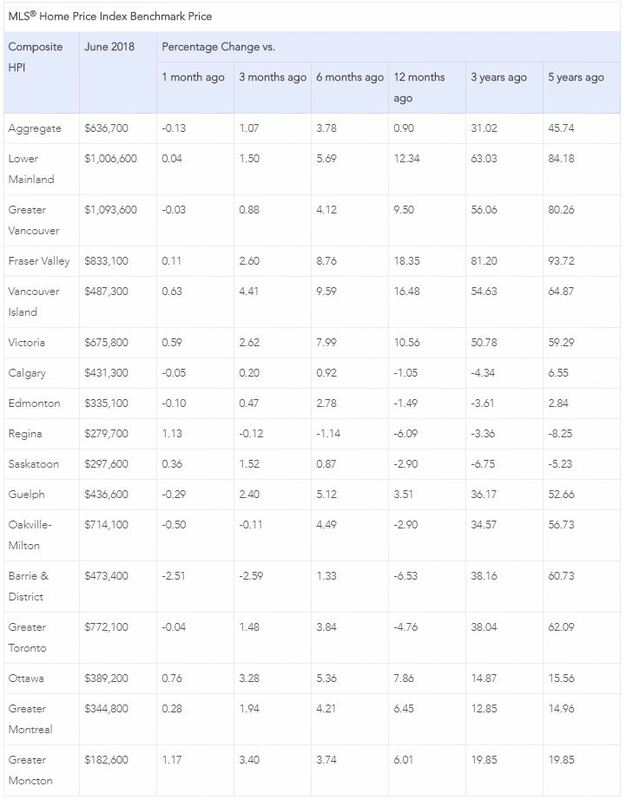 Home price growth is moderating in the Lower Mainland of British Columbia (Greater Vancouver Area: +9.5% y/y; Fraser Valley: (+18.4%), Victoria (+10.6%) and elsewhere on Vancouver Island (+16.5%). Within the GGH region, price gains have slowed considerably on a y/y basis but remain above year-ago levels in Guelph (+3.5%). By contrast, home prices in the GTA, Oakville-Milton and Barrie were down from where they stood one year earlier (GTA: -4.8%; Oakville-Milton: -2.9%; Barrie and District: -6.5%). The declines reflect rapid price growth recorded one year ago and masks recent month-over-month price gains in these markets. Calgary and Edmonton benchmark home prices were down slightly on a y/y basis (Calgary: -1.0%; Edmonton: -1.5%), while prices declines in Regina and Saskatoon were comparatively more substantial (-6.1% and -2.9%, respectively). Benchmark home prices rose by 7.9% y/y in Ottawa (led by a 9.1% increase in two-storey single-family home prices), by 6.4% in Greater Montreal (driven by a 7.4% increase in townhouse/row unit prices) and by 6% in Greater Moncton (led by a 6.5% increase in one-storey single-family home prices). The actual (not seasonally adjusted) national average price for homes sold in June 2018 was just under $496,000, down 1.3% from one year earlier. While this marked the fifth month in a row in which the national average price was down on a y/y basis, it was the smallest decline among them. Housing markets continue to adjust to regulatory and government tightening as well as to higher mortgage rates. The speculative frenzy has cooled, and multiple bidding situations are no longer commonplace in Toronto and surrounding areas. 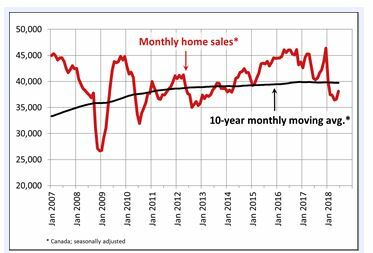 The housing markets in the GGH appear to have bottomed, and supply constraints may well stem the decline in home prices in coming months. The slowdown in housing markets in the Lower Mainland of B.C. accelerated last month as the sector continues to reverberate from provincial actions to dampen activity, as well as the broader regulatory changes and higher interest rates. Five-year fixed mortgage rates have already risen roughly 110 basis points, while rates for new variable mortgages rose by close to 40 basis points. Since the implementation of new mortgage standards, nonprice lending conditions for mortgages and home equity lines of credit have also tightened. Additional rate hikes by the Bank of Canada are coming, although the Bank will remain cautious particularly in light of continued trade tensions with the United States.